If you’re just getting into amateur radio and Morse code, then you’ll need to get up to speed on what RST means and how to use it properly. If you’re operating phone or voice, you’ll give just the first two, the R and the S.
The first number, “five” is a measurement of readability. It’s how clear your voice is. Here’s where you can get confused. A completely clear transmission doesn’t have to be strong at the same time. The incoming transmission could be very weak, but you can understand each word said – as if someone’s whispering in your ear. That’s why the operator would deserve a 5 on the readability scale. The second number “nine” is a measurement of the strength of your voice to the other operator. A nine, the highest value you can assign, would mean your voice was as strong as if you were in the same room with him and talking at a normal volume. You can see those “S” scale markings in the photograph below. 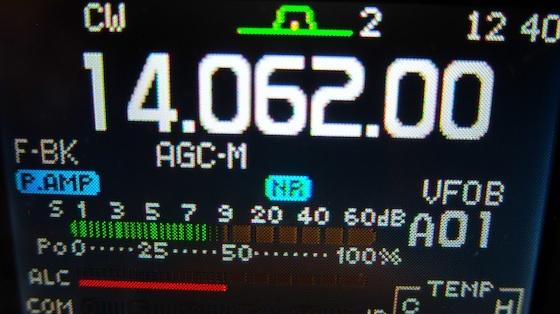 Modern radios tend to have digital readout signal strength meters. They can help you with the S component of the report. Here’s a photo of the digital meter on my ICOM 7000 radio picking up a Russian station sending Morse code that was producing an eight for signal strength. When you decide to do Morse code, you add another component – Tone. As you might expect, assigning values to something you hear is subjective. You may have young ears that didn’t get damaged by 20-plus years of working with screeching circular saws like mine. Back when I was a young carpenter, no one told us about ear plugs or ear muffs so I’ve got both hearing loss and significant tinnitus. This means that your signal to two different operators sitting is the same room listening to the same speaker might produce two different reports! Use the following tables that I borrowed from the Straight Key Century Club. They are an excellent source of information if you’re just discovering the magic of Morse code. Study these and do your best when giving a realistic signal report. Don’t ever embellish a report. Most operators want the truth and they want to know how band conditions are between your station and their location. There’s no shame in giving an operator a 329. Oh, one more thing. As you enter the world of contesting, the RST report goes out the window. It seems everyone, no matter how weak their signal, gets a perfect report of 599!